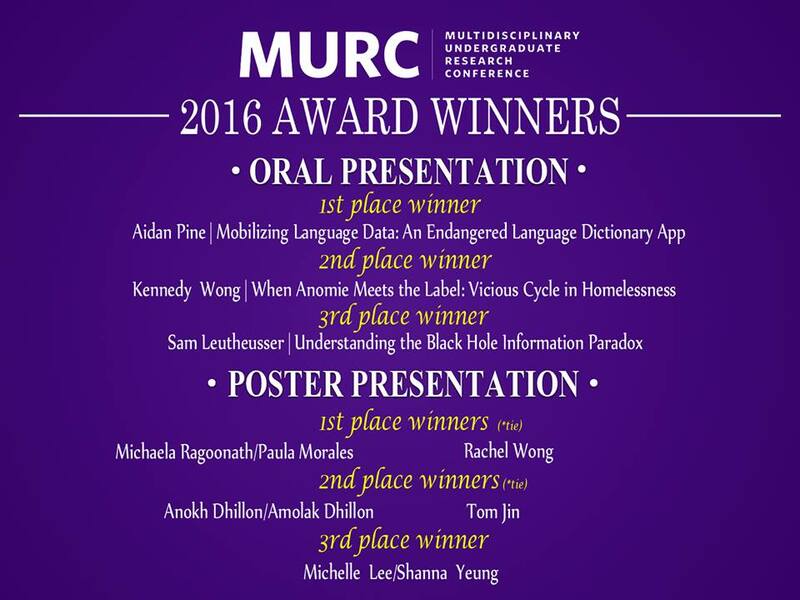 My partner Michelle and I won the 3rd place Poster presentation competition at UBC 2016 Multidisciplinary Undergraduate Research Conference. We didn’t expect to win anything so our prize was a surprise bonus. Personally, the best part of the conference was getting insightful questions that led us consider interesting other things we tweak with our project, the great suggestions on how to improve our project and learning about the research that other people do. Oh, and even one of the judges gave us his contact information because he wanted to refer us to the group that he does research with (cool!). I’m so grateful to our mentor, Dr. Matthias Gorges, for all his guidance and for inspiring Michelle and I to get really interested in this! proud. I’m glad we made him proud. He said “This is a great accomplishment (think of it being in the top 1.5% of MURC posters) – well done!”. I’m really really thankful to my partner Michelle. We worked really well together because we supported each other where the other was weaker. While we were presenting, we also filled in any bits of information that the other left out. Overall, my experience working with Matthias and Michelle involved a lot of learning, and enjoying research as both fun and collaborative! I definitely recommend trying out the Research Experience mentorship to learn about a field of research that you’re unfamilar with, meet a great mentor, and have fun making friends with other students interested in research. This week, I been more focused on my extracurriculars: preparing for the research conference this week, working with a very friendly and insightful theatre group representative on my play from last year, and just today: reaching out to different blindness and vision impairment related charities, planning and booking a philanthropy event for next week for the club I’ve recently started with my friends called Vision Health Volunteers, as well as spending the evening at our event at Dark Table today! Even though yesterday was hectic, I just become more efficient when there are more demands on my time. As long as you strongly believe in what you’re doing it and you can find enjoyment in doing it, keep doing what you’re doing! To be honest, our event tonight had some unforeseen mishaps. Though I definitely felt a flare of “Oh no! !” when each time a new problem was added, I surprised myself by how I was able to force myself to detach emotions/fear/anxiety in order to think through solutions carefully and stay humorous! We’re stronger and better at handling problems than we may think! Thank you to Valerie, Veena and Winston today. After the club event, it was fun to go de-stress with these three afterwards on an little adventure. You all know how much I’m glad to have Veen as a friends so today new friend feature: Valerie says the funniest things so she instantly lifts the mood of people around her. Always a pleasure to be around. I want to shape this blog to incorporate more content that you readers want to hear about. Let me know in the comments or email me at shannayeung@gmail.com what you want to hear about: general topics such as UBC, university, dealing with school/stress/whatever (if I don’t know, I’ll try to find someone more qualified to answer your question), living in Vancouver or specific topics personal to my experience that I’ve mentioned on this blog. Please indicate whether you’d like to be credited for your questions/suggestions or if you would rather remain anonymous. Enjoy the beautiful weather everyone! Previous Previous post: What’s on your reading list?